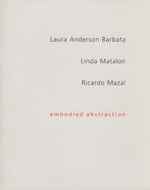 This exhibition catalogue covers the work of three artists in New York, whose paintings, sculptures, and drawings engage the modernist tradition and the legacy of abstraction while addressing concerns of the human body. Anderson and Mazal hail from Mexico, while Matalon is a Cuban American. The catalogue includes texts by Joseph R. Wolin. 1997 32 pp. 12 color illus.